The new Occasions catalog and Sale-A-Bration promotion starts January 6th! My friend, Christa Halbesma, and I are celebrating with 5 days of new projects featuring stamp sets and other products from the Occasions and Sale-A-Bration catalogs. Check out both of our blogs every day this week for fresh ideas. Christa's blog is Dusk till Dawn. Be sure to use Google translate to see her posts in English. This Scalloped Treat Holder made with Stampin' Up! 's Scallop Circle Framelit and the Painted Petals stamp set is perfect for holding a Ghiradelli chocolate treat. When I went to Stampin' Up! 's new Occasions and Sale-A-Bration catalogs kickoff in Plano in December, this was the stamp set that I won as a door prize. So for our demonstrator Christmas party, I decided to use this stamp set to make my little stocking stuffer gift for my friends. 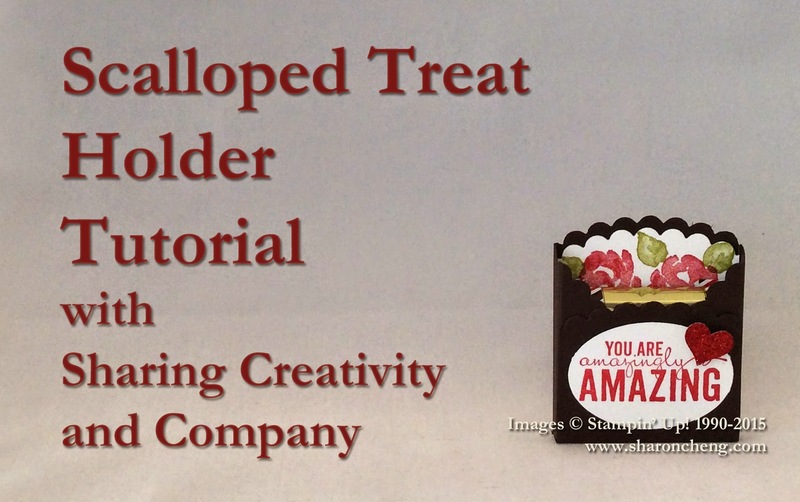 I adapted this treat holder from Out to Impress to fit Stampin' Up! 's Scallop Circle Framelit. It is pretty quick and easy using the Simply Scored Scoring Tool. I love how the Painted Petals stamp set make it look like you shaded or double stamped the flowers and leaves. Because of how the stamp is made, you only need to stamp once! The ink is darker in some places to give the illusion of a painted petal. Visit my online store to get what you want for your next project. Remember that when you purchase $25 or more in product, you are eligible for my Rewards Program. During Sale-A-Bration, for every $50 you spend, you can pick one exclusive item for free! Buy the Painted Petals Stamp Set and Circle Collection Framelits and you qualify for one free Sale-A-Bration item! This is sooooo cute! Can't wait to see all your fabulous projects! Love your sweet little treatholder. Thank you for the nice tutorial/video!